Having trained in Finger Free © Reflexology with its founder, David Wayte, I am delighted to have achieved Certified Practitioner status, enabling me to encorporate these new techniques and benefits into my Reflexology treatments. An important function of Reflexology is to restore the energy that flows through channels which run throughout the body, called meridians. Just as we have veins and arteries that carry blood and deliver oxygen to every part of our body, we also have energy lines, the meridians, that carry energy or Life Force (known as Chi in China and Prana in India) throughout our body. Zone therapy, discovered by Dr William Fitzgerald and later refined and developed by Dr Joe Shelby Riley is at the core of the history of Reflexology....but often gets forgotten in the actual practice of Reflexology! A disruption in the flow of energy in the meridians may bring many negative effects, potentially causing physical symptoms such as pain, stiffness, soreness, etc., as well as emotional upset and ill health. Using specific techniques, Finger Free© Reflexology spends considerable time working the zones on the feet where the meridians lie, with the aim of freeing up blocks that may exist in the energy flow thereby restoring balance and function throughout our body; the same principle of Shiatsu and also Acupuncture....but without the needles! As a practitioner of other energy-based therapies such as Reiki and EFT (Emotional Freedom Technique), where time is spent freeing up blocks in the body's energy system to restore balance and well being, I know the importance of keeping the body's energy in a state of free flow and the dividends this brings. Please try it.... I am confident you will love the benefits it brings! Why are the Meridians important? As you will see from the descriptions below, the meridians and the flow of energy through them, have a bearing on all of the organs, glands and systems of the body. It makes sense therefore, to keep the energy in a state of free flow so that every organ, gland and system can function at an optimum level. Meridians circulate energy from one meridian to another in a continuous flow and in so doing, each affects the others. Due to the circular nature of meridian energy, just as water that does not flow freely will stagnate, so too will energy that is stationary for too long, become stagnant. This stagnation can then have a knock-on effect for the previous meridian in the loop and the one before that, until the whole energtic system stagnates into a shut-down state. 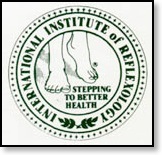 Reflexology, IIR, AOR, FFR Cert, International Institute of Reflexology, Association of Reflexologists, VRT, Vertical Reflexology in Sheffield, Finger Free Reflexology, holistic therapies, complementary therapies, alternative health, relaxation, wellbeing, health, peace, calm, wellness, stress reduction, spiritual development, personal development, in Sheffield, Bradway, Dore, Totley, Nether Edge, Ecclesall, Norton, Meersbrook, Crookes, Walkley, South Yorkshire, Dronfield, Holmesfield, Coal Aston, Eckington, Derbyshire, Chesterfield, Brimington, Hasland, Newbold, East Midlands, Peak District, Hope Valley, Hathersage.